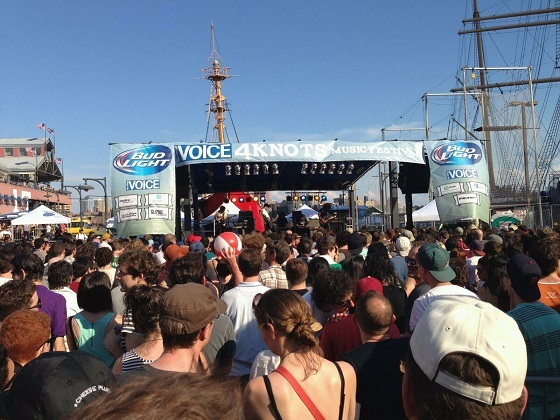 We took a cursory glance at the lineup before leaving my girlfriend’s Manhattan apartment for the seaport (read: I asked my girlfriend when Kurt Vile was supposed to come on to which she replied “7 o’clock.” Then I asked if The Men were still scheduled to play to which she replied “Yes, but it doesn’t say when.”). 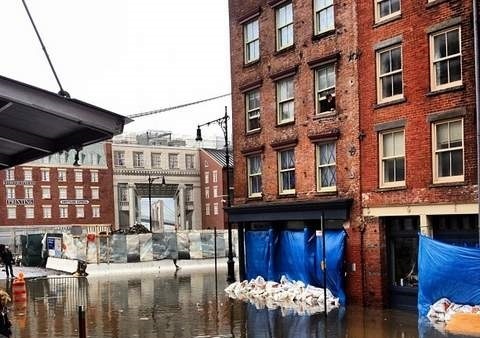 We didn’t arrive at the seaport until a little after 4pm; I insisted that we had a few drinks beforehand at a nearby bar. We were meeting friends at the show and so recon was our initial focus upon arrival at Pier 17 which was in between acts at the time. Our friend Emily was the easiest to find as she was in the press area taking photographs. As my girlfriend talked with Emily I found the two-stage schedule along the railing. We had already missed Fat Tony and Marnie Stern to my chagrin, the only other acts that I was familiar with, albeit barely, but I would have enjoyed seeing them nonetheless. From there I spotted a sunburnt duo of high school friends, DD and the infamous setlist.fm’er, Jonny J, toward the back of the audience. We watched the majority of the White Lung show in the blistering sun. They didn’t have the tightest live performance, but the acoustics weren’t helping their sound either which was a dense punk rock blast. Plus, I was admittedly perturbed by singer Mish Way’s physical and gestural resemblance to my sister from a distance. It wasn’t the most thrilling show, but the energy and hooks were definitely there (I remember “Glue” breaking through). I enjoyed them enough to order their 2012 record Sorry from Canada which cost me more in frigging postage. When White Lung started packing up I suggested, as I am wont to do, that we get out of the sun and enjoy some cold beers. In the shade of the neighboring beer pavilion DD talked excitedly about The Babies’ cutesy, lo-fi set, another act we missed, over Budweisers. I had never heard of The Babies but reaffirmed DD’s notions upon listening to their self-titled album a week later. Exclusive of The Babies neither he nor Jonny J were blown away by any of the other sets which they had seen. We got another round in preparation for The Men. I listened to a lot of The Men’s Open Your Heart last year and was excited to hear them in person as their throttling guitar, crashing drums and grungy vocals seemed perfectly conducive to a live show. I wasn’t off-point; the distortion was cranked and the shared vocals of Nick Chiericozzi, Chris Hansell, and Mark Perro were well-anchored by drummer Rich Samis. They began their set with a extended feedback jam to which my girlfriend asked, “Is this what they sound like? They reigned things in halfway through the set and, though it wasn’t one of their own, their cover of The Stooges’ “I Wanna Be Your Dog” was the highlight of the show. 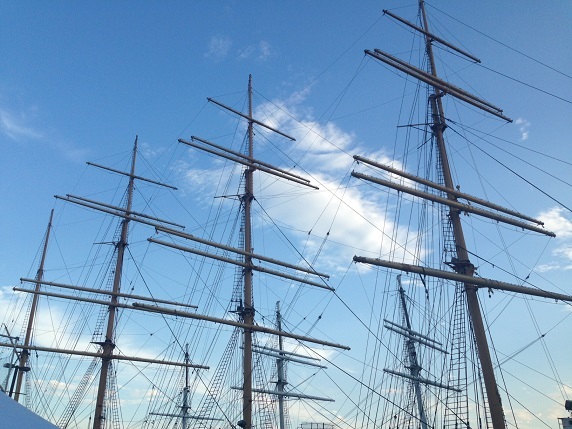 Above: The sail-less masts of The Peking which was docked to the right of the Pier 17 stage. There was an hour layover between The Men and Kurt Vile and so I once again suggested we seek refuge from the heat, this time returning to the bar that my girlfriend and I visited before the show. We ordered a few rounds, tater tots and played a best of five of Animal Guess Who? Aside: If you’re going to play the animal version of Guess Who? always start off with the question, “Is your animal brown?” It eliminates a third of the morons if you’re lucky. If you’re going to play the original version of Guess Who? never switch your character back and forth between Eric the Policeman and Franz the Effeminate Ginger; that was my sister’s downfall. 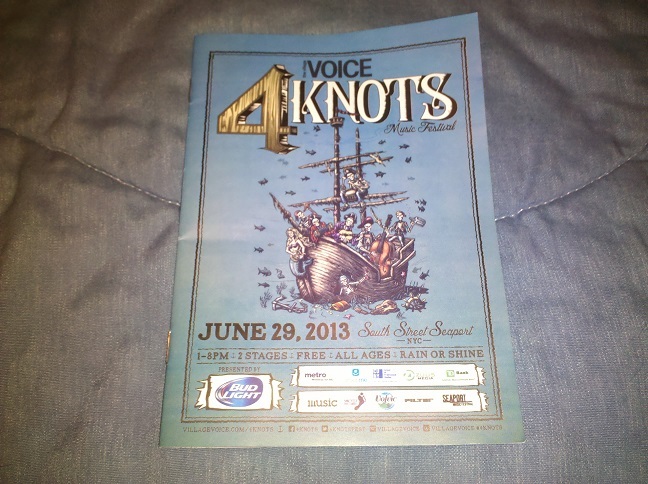 We doubled back to the seaport for the much anticipate Kurt Vile show and got there right on time. He opened with the almost title track off of his 2013 Wakin on a Pretty Daze. Above: My view of Kurt Vile. 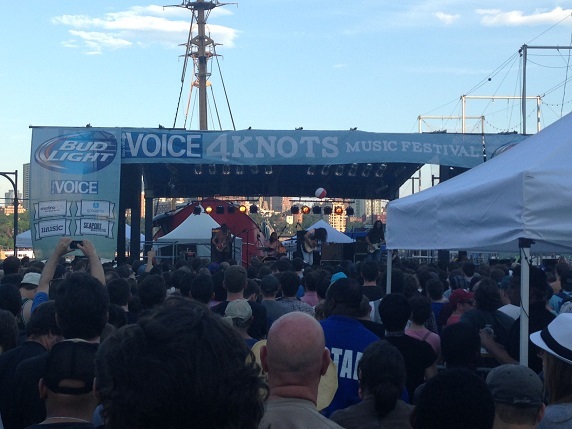 Above: Emily’s view of Kurt Vile. 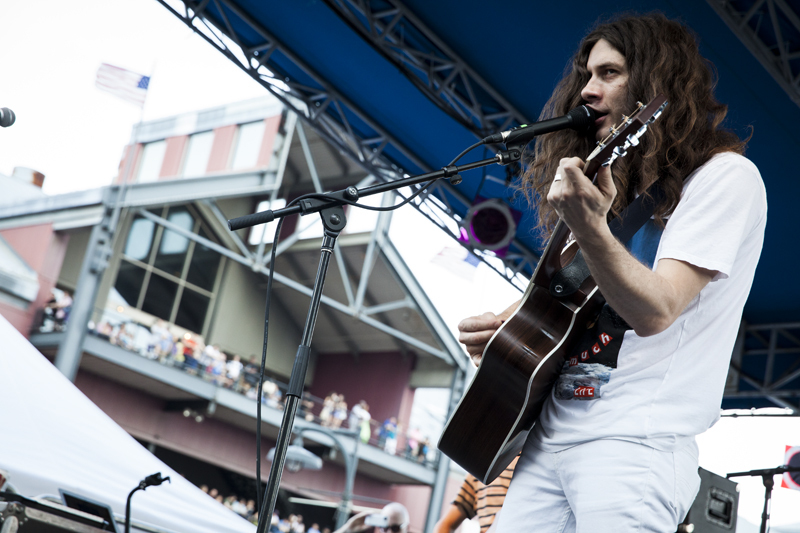 Kurt Vile’s set was a mixture of old and new, predictably weighted in his latest album. Our collective group made quiet, hopeful requests in between songs. Jonny J wanted to hear “Shame Chamber” and part of the romantic in me wanted to hear “Baby’s Arms” while in my baby’s arms (my girlfriend…I don’t have any children…at least I hope not). We were all hoping for another 30 minutes of play when Vile closed with “Freak Train” off his second album, Childish Prodigy, but who can complain about an hour plus of free music from an artist that you like? Well, we did, but we’re all music brats. Between Jonny J, the aforementioned setlist.fm aficionado, DD and I we were able to come up with the complete setlist which Jonny J posted that evening while my girlfriend and I enjoyed our anniversary dinner. Enjoy the live link to “Peeping Tomboy” below!